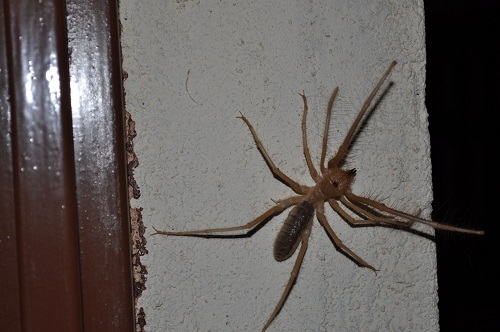 One of the many solifugids we've made friends with. As TBI students begin our second module (Ecology of the Turkana Basin) we’ve begun to get more and more familiar with the smaller beings we share our space with. Our professor, Dr. Dino Martins, is teaching us about the ecology of the Turkana basin in terms of (sometimes not so) small creatures with very large ecological importance. So far we have begun work on individual research projects, taken transects and quadrads of local flora, and done a good bit of bee hunting. As our professor would say, “bugs rule the world.” Today we took a field trip just a short way off of the compound to hunt for bees, as well as a new species of bee parasites never before captured. We’ve also gone on several outings purely for observation: on Wednesday Dino led us outside of the compound to check out a Caralloma foetida he’d found. Foetida smells of rotten flesh when in bloom, thus tricking flies into coming to it and then pollinating it.